In tandem with this Blog site we have another Blog site which is devoted to Landscape Research through imaging particularly 3D imaging. You can visit the LRC Imaging Blog by following the link below where you can see examples of 3D imaging projects including experimental work using drones, the recording of excavations and of individual objects. The LRC Digital Atlas has been functioning almost flawlessly for a number of years, unfortunately recent changes (upgrades ) of the windows server, where it is hosted, seem to have caused data serving problems which have stopped it from functioning all-together. Whilst the problem at the host end is being resolved a new version has been installed on the LRC archive server, which although very slow does work as intended with the exception of one or two image files. very slow should perhaps be amended to exceptionally slow, a consequence of the poor connection between the LRC server and the internet resulting from our relatively remote location. The check box which loads the geophysical survey results (hundreds of megabytes of data) is particularly slow, when clicked it may take 10 minutes before the time bar shows that the data has loaded. The Ryedale Folk Museum, situated just outside Kirkbymoorside, on the edge of the North York Moors is a little gem of a museum which combines archaeological, architectural and craft collections with one of the most comprehensive collections of treen and other post-medieval domestic artifacts to be found in any rural museum in Britain. It also has a small but stunning single room art gallery, established in 2011 for a small temporary exhibition of works by Barbara Hepworth, Henry Moore and Terry Frost. 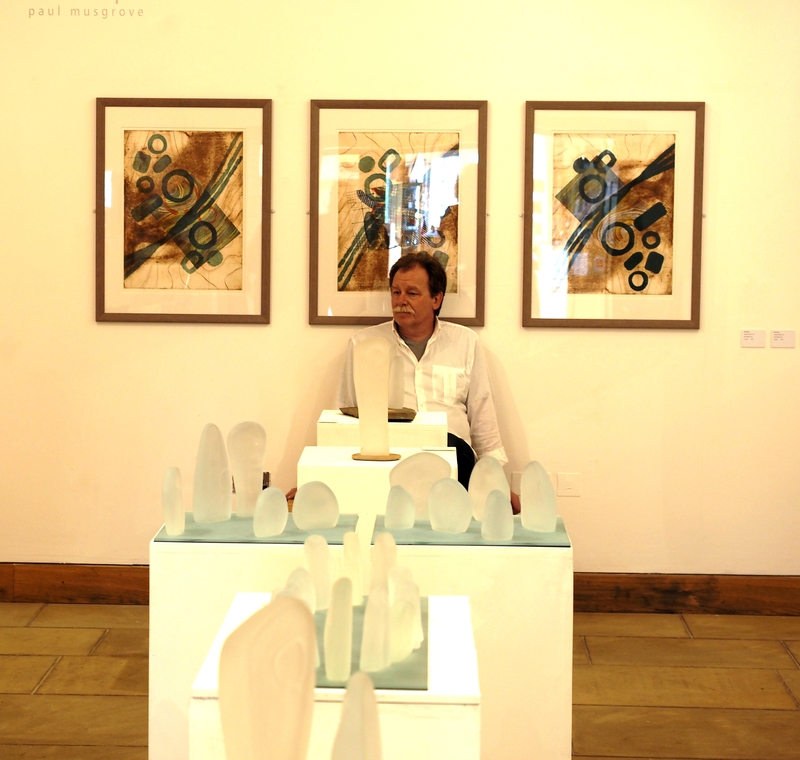 The gallery provides a splendid setting for the latest exhibition by printmaker and glassworker Paul Musgrove. More than 30 works are in the exhibition which combines a number of unique glass ‘standing stones’ and a variety of Japanese wood-block prints and etchings many of which have been inspired by the results of air-photographic and geophysical surveys and excavations undertaken over more than 3 decades by the Landscape Research Centre in and around the Vale of Pickering. During the first few years of the rescue excavations begun at Cook’s Quarry, West Heslerton in 1978 Paul was an active member of the excavation team and site photographer. The gallery is little publicised, but must be one of the best exhibition spaces to be found in the region. In addition to examples of work derived from the major archaeological surveys a lot of new work influenced by the buried archaeological landscape of the Vale is joined by others influenced by visits to Orkney and other part of Scotland, where Paul is based. Having visited a number of Paul Musgrove’s exhibitions over the last few years this is exceptional both in terms of the work presented and the gallery space. The work on display is exciting and affordable whether you are interested in his Archaeoprint series or by the fabulous glass table-top sculptures. A very fine example of the influence of archaeology on contemporary art. The Landscape Research Centre has been at the forefront of research into digital recording techniques for the field archaeologist since it adopted the use of handheld computers for recording in the field in the mid 1980s. A series of small excavations on the severely damaged remains of a Late Bronze Age-Early Iron Age Hillfort at Boltby Scar on the North York Moors have been the setting for a series of 3D imaging experiments employing, with the assistance of Leica UK 3D laser scanners and 3D Imaging from photography. 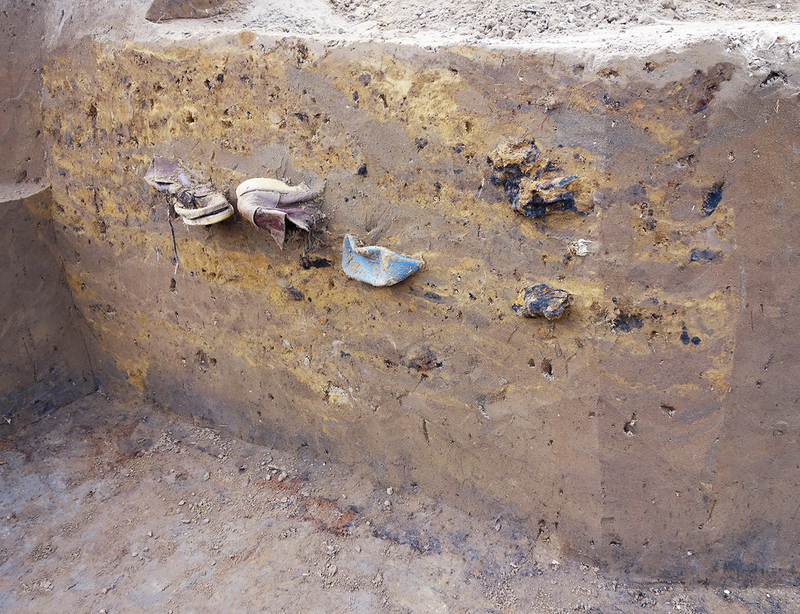 The link below gives an idea of the level of detail returned in a photographic 3D model of a section through a robbed Bronze Age barrow, note the turf deposits showing towards the two ends of the section where the mound had suffered least disturbance. The extraordinary levels of detail documented using this method has underpinned a significant re-interpretation of the evidence documented during the excavation which would not have been possible from the examination of the 2D static images alone. Click here to see the Boltby Scar Barrow Section. Dry hot spell following horrendous long wet winter exposes hidden archaeology and other things lurking in the fields. Climate change, increasingly industrialised agriculture and changes in the crops being grown are influencing our knowledge of the past. The relatively extreme weather patterns that we are experiencing in Britain influence the way that arable crops grow revealing archaeological features buried and forgotten often for thousands of years. These crop marks, a function of contrasts between the undisturbed subsoil and cut features such as ditches and pits or structural foundations result from differential growth patterns which have influenced the development of the root system and thus the speed at which crops ripen or suffer from stress in dry spells like we are having at present. 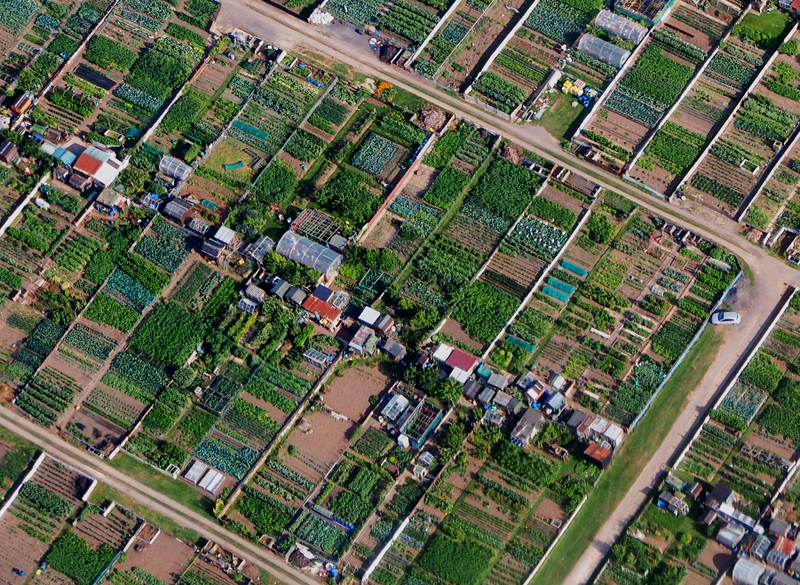 Air photography over the last century has been the biggest single contributor to our knowledge of the scale of past settlement in Britain. It has become blatantly obvious during the last twenty years that new and previously unknown features have been appearing even in very extensively studied landscapes and that their appearance owes much to the increase depth of ploughing that has accompanied the introduction of ever bigger farm machinery. Deeper ploughing cuts away and disturbs buried archaeological deposits such as the floor layers of prehistoric houses, mixing the material in the plough soil and leaving only truncated features beneath. Pits, ditches, wall footings or post-holes that cut deeper than the depth of the plough will ultimately be all that survives this modern hyper mechanised agricultural revolution and will, if we are not careful, be all that is left to help us understand human interaction with the British landscape over the last 12,000 years. A casual look at the Yorkshire Wolds in winter, when large areas of ploughed fields can be seen, indicates the levels of plough damage that have changed the thin plough-soil to a material mostly made of rock. The Wolds are becoming whiter every year as more chalk is broken up and added to the plough-soil, the chalk of the Wolds has not been so exposed since the last glaciers receeded. The crops are late and the weeds confused but as the weather has settled down, leaving many in a state of disbelief, the crops have started to turn, producing crop marks that were last seen emerging at the beginning of May last year, before the deluge began. Field archaeologists are as tied to the weather as farmers, even more so if they are also engaged in aerial archaeology, if this present dry hot spell continues we would expect to see crop marks all over Britain and new discoveries made every flight; filling in gaps in the human landscape that could only be otherwise approached with a vast investment in ground based geophysical surveys and on the ground investigation. The combination of factors of climate, crop, soils, local and short term weather creates conditions that are effectively unique every day, conditions that may expose vast areas of hidden archaeology even if most often we are unable to securely date and precisely interpret what we see. Enclosures and track-ways from a probable Iron Age or Roman settlement cut through by a now abandoned railway line and trapped between a modern housing estate and a golf course. 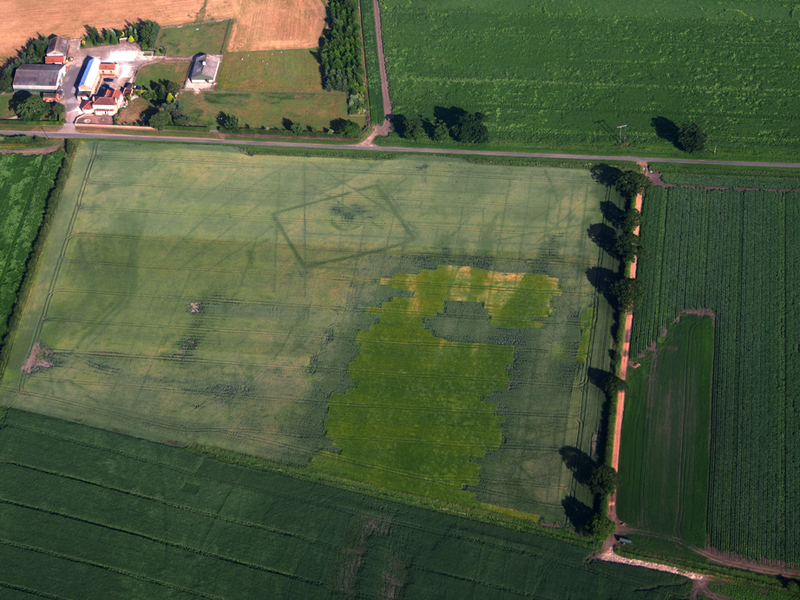 What appears to be an Iron Age farmstead with a single roundhouse in a rectangular enclosure in an environment with poor drainage as demonstrated by the network of field-drains which cut through both the enclosure and what appears to be a track-way and other less clear features in the left hand part of the frame. 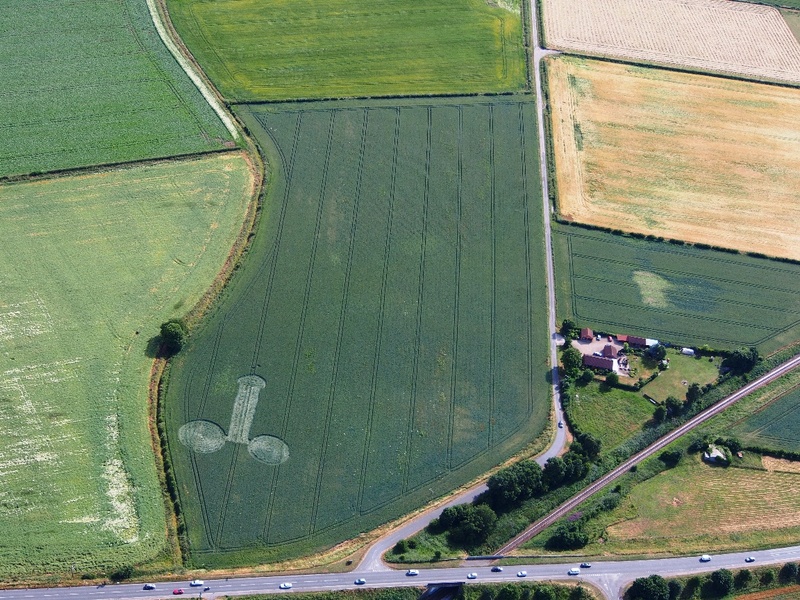 Some people, I understand, believe that crop circles are the product of Aliens, if this is the case one wonders what sort of ambitions this particular crew had when they created these marks in a field near Poppleton just outside York. I suppose this provides some context for my four year old who refers to Crop-marks as Crock Marks..or maybe he is saying something else.